BETSY MASON is an award-winning science journalist based in the San Francisco Bay Area and co-author (with Greg Miller) of the National Geographic blog "All Over the Map." She was a 2015-2016 MIT Knight Science Journalism Fellow. Previously she was the online science editor for Wired and the science reporter for the Contra Costa Times. Before becoming a journalist, Mason earned a master's degree in geology at Stanford University. GREG MILLER is a science and tech journalist based in Portland, Oregon. Previously he was a senior writer at Wired and a staff writer at Science, where he won several honors. Miller earned a Ph.D. in neuroscience at Stanford University. He has appeared on public radio's Science Friday to discuss maps and has given talks on a wide variety of cartography-related topics. 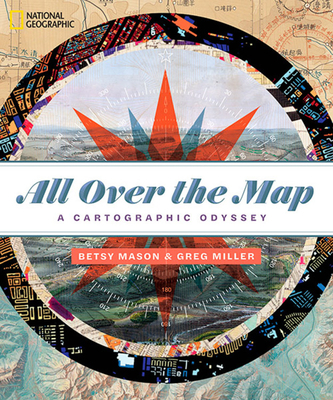 "Science journalists Greg Miller and Betsy Mason took their obsession with maps—historical, geologic, science-y, even of other worlds—and translated that into one of the most beautiful and interesting compendiums of stories I've ever read. The book is filled with over 200 maps, some famous, like maps of the ocean floor, some obscure, like a geologic map of the moon, which is easily one of the visually craziest maps I've ever seen. I can't recommend it highly enough."